If the presidential election scheduled for Sunday in the Democratic Republic of the Congo actually takes place, it could lead to the first “peaceful” transfer of power since the United States' Central Intelligence Agency, in cahoots with the United Nations, Belgium and other Western nations, overthrew Patrice Lumumba, the country's first democratically-elected Prime Minister in 1960. The scheduled presidential, legislative and provincial elections were supposed to occur in 2016. However, outgoing president Joseph Kabila - who was not eligible for another term - refused to organize elections because he wanted to hold onto power. But the Congolese people forced his hand, despite his security forces gunning down activists, driving others into exile and jailing scores of youth, some of who remain in prison to this day as political prisoners. Regional powers such as Angola and South Africa, along with other members of the international community, weighed in to press Kabila into conceding. Finally, Kabila named a successor to run for president in August of this year. Emmanuel Ramazani Shadary, a party hardliner and former Minister of Interior who is under sanctions by the European Union for committing human rights abuses in the Congo, has been designated by Kabila to succeed him. Kabila has been ruling by force without the consent of the people for years and can continue to do so. He controls the purse strings, the military, the police, the constitutional court, and the electoral commission. He is also the head of the Majority Coalition electoral platform, The Common Front for the Congo (FCC in French). But the key missing factor for Kabila is legitimacy - in the eyes of the international community rather than of the Congolese people. The regime has come under increasing pressure from outside powers, which played a significant role in his ascension to power in 2001 and his tenure as head of state for the past 17 years, and the main purpose of these elections is to secure legitimacy so his coalition can continue to hold onto power. In an effort to retain his good standing with his former suitors, the Kabila regime hired an Israeli security firm, Mer Security and Communication Systems, to lobby the Trump Administration to back him. Kabila has reportedly doled out $8 million dollars to pay U.S. right wingers with connections to President Trump to retain the U.S. backing that he has had since 2001. One of the key targets of Kabila's lobbying efforts is former New York mayor Rudy Giuliani. who attended a party thrown in Washington by the Congolese government to attract Trump insiders. In addition, pro-Kabila lobbyists appear to have made headway in painting a benign picture of Kabila in international corporate media outlets. In the past week, Kabila has been interviewed by National Public Radio in the U.S, the New York Times, the Washington Post and by BBC News, the Financial Times and Reuters. As well as answering questions on such issues as his favourite movie and whether he smokes weed, he claimed that he was organizing perfect elections and even suggested that he may return in 2023 to run for president again. The Vatican's top representative in the Congo, Archbishop Laurent Monsengwo has said on record that Congo is an open-air prison under the Kabila regime. As for perfect elections, the 2018 Nobel Peace Prize winner, Dr. Denis Mukwege says what is happening is a “parody of an election”. These realities appeared to be tangential to much of the questioning by the journalists who went to visit Kabila. It is still very uncertain whether elections will take place on December 23. If they do, they will be chaotic at best and disastrous at worst. The Congolese people are seeking to seize the opportunity to overturn the Kabila regime with or without perfect elections. 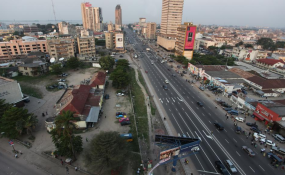 They are mobilized at an unprecedented level, hitting the streets in large numbers for rallies at each stop made by the two main opposition candidates, Felix Tshisekedi and Martin Fayulu, and defying the repression of the security forces. Fayulu's plane has been blocked from landing in key cities on his campaign route and in Lubumbashi, security forces sprayed Fayulu's supporters with hot water from tanks, launched tear gas to disperse crowds and fired live bullets at supporters, killing at least five people, wounding dozens and arresting scores of others. As the regime uses its security forces to upend the opposition's campaign, it has brought all the resources of the state to support Shadary. A glance at Congo's national television reveals only his campaign messaging. Despite the regime's repression and obstruction, the greatest threat to the elections appears to be country's electoral commission itself (CENI in French). The use of electronic voting machines, with which most Congolese are unfamiliar and which are seen as an instrument to facilitate cheating, as well as a suspect voters' roll, raise serious questions about the reliability of the elections. Even accepting their use, it is not clear that the CENI has delivered the 100,000-plus voting machines to the more than 75,000 voting booths. In addition, the CENI reported over last weekend that it was in South Africa to secure the 1,662,386 ballots that were supposed to be delivered and in place by December 5. It will be impossible for these materials to be delivered to polling booths in less than a week, especially in a country the size of Western Europe and with limited infrastructure. Irrespective of what the CENI does or the repressive practices of the Kabila regime, the future of the country is in the hands of the Congolese people. The large crowds that have turned out have been unequivocal in their demand for a change in leadership and have declared that they will not accept a Shadary power grab. Should Shadary be announced as the victor, which is highly likely, they have vowed to take to the streets to reclaim their country. The next week is a time of reckoning for the Congolese people, with the future of their sons and daughters at stake. Kambale Musavuli is a Congolese democracy activist who serves as national spokesperson in the United States of the Friends of the Congo, a group that raises global consciousness about the country's situation and provides support to local institutions in the Congo.